More than 50 people have been killed and over 130 wounded in as many as five bombings in the northeastern Nigerian city of Maiduguri. No group has yet claimed responsibility, but suspicion falls on Boko Haram as they have previously targeted the area. However, no exact figures for the number of people killed and injured have so far been confirmed. According to the latest updates from police, a total of 58 people died and about 139, including many children, sustained injuries, AP reported. At the same time, other sources have put the death toll at 54 and a number of wounded at 143. It has been also reported that there was a string of bombings across the city. Up to five explosions targeted different areas of Maiduguri, the largest city in northeastern Nigeria, one after another. The first explosions rocked Baga fish market, located near a crowded market named "Monday Market" which has evolved into a daily market, around midday. The Baga bombing appears to have been the deadliest of the five attacks; 36 deaths were reported there. “The bomb was devastating because it occurred in a crowded area,” Jamuna Jarmi, a grocery seller, told the local Vanguard News. Witnesses claimed it was carried out by a female suicide bomber who arrived in a motor rickshaw. The terrorist attack was followed by another suicide bombing, also near the Monday Market, just an hour later. The witnesses reported a bomb exploded near Post Office shopping area causing numerous casualties. Shortly afterwards, the Monday Market itself was also was targeted by female suicide bombers, who detonated bombs killing dozens of people around them. According a trader, who spoke to the BBC, one of the bombers had a bomb strapped to her body, while another one was carrying a bag containing an explosive. 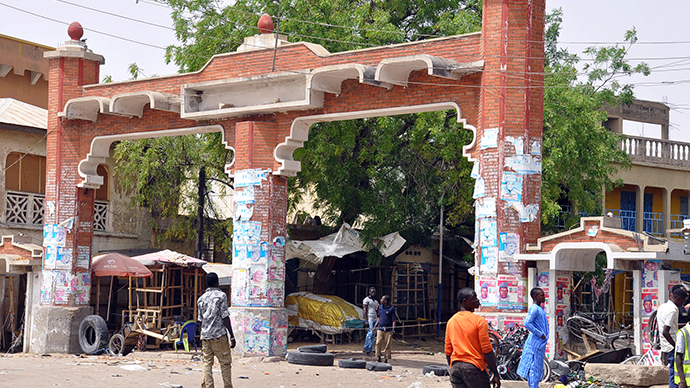 The fourth attack hit in the busy Borno Express bus terminal. A witness managed to count about 12 lying bodies but was unsure if they were dead or injured. According to Danlami Ajaokuta, a vigilante leader, the security forces ordered the closure of all shops in the city, fearing more attacks could follow. The latest attack took place at a checkpoint in about 80 km from Maiduguri. Three people were wounded as a bomb hidden in a car exploded. No militant organization has taken responsibility for the attacks, but Boko Haram is primarily under suspicion as the group sees Maiduguri as its strategic goal. Another distinctive feature that points towards Boko Haram is female suicide bombers, who are widely used by its terrorists. Boko Haram, which wants to establish an Islamist caliphate based on Sharia law in northern Nigeria, controls vast areas that make up a territory approximately the size of Slovakia. The militants reportedly plan to proclaim Maiduguri their capital in case they seize the city. The terrorist organization last tried to take the city in December 2013. They managed to seize a local air force base which led to clashes with regular troops.